You must make reservations at least 5 minutes in advance of the time at Ebisu on Robson. Impark operated parking is available behind the building. Street meter parking along Robson, Bute and Haro Street. Approximately 5-10 minute walk from the Burrard Skytrain Station. There is a bus that stops on the corner of Robson and Bute, downstairs from the restaurant. The first and only Japanese Restaurant Lounge featuring some of the best deals for food & drinks in town! 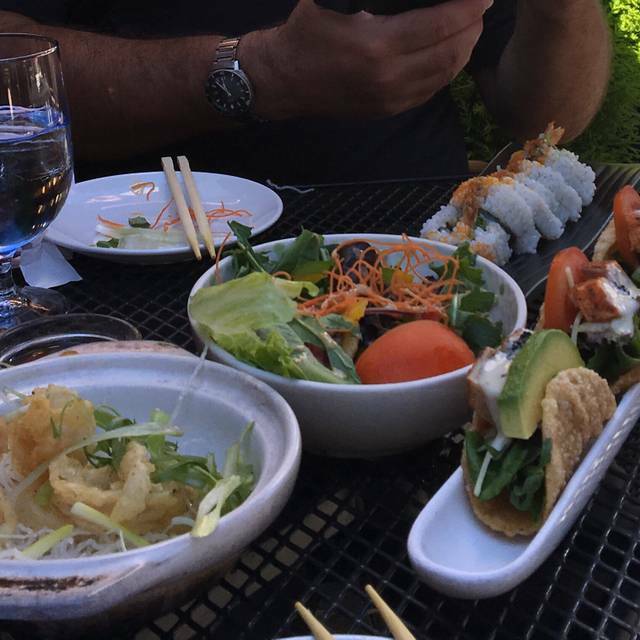 Delicious tapas and inventive, original sushi created by our master chefs straight from Japan! The trendy modern design of our spacious interior, TV"s and big projector screen help to set the perfect ambiance for any occasion. Quick business lunches, intimate romantic dinners or large group parties of any size are welcome! 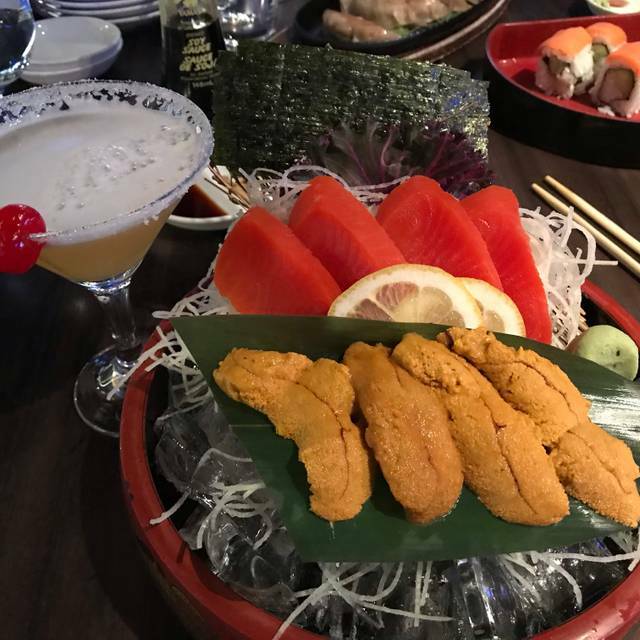 Set in the heart of Robson this stylish izakaya restaurant lounge is the hottest new spot that many local dining enthusiasts have been craving for! Our innovative adaptation plays with the contrast of East meets West. Ranging from the freshest sashimi straight out of Japan to home-cooked dishes with a twist. Oriental style pastas, juicy steaks or even sushi rolls flame seared right in front of you! There is definitely something for everyone! Japanese Sapporo beer is now available on tap for you to enjoy! Spread the world! Bring your business! It's Japanese for sharing! Chill your senses! Warm your tastebuds! Classic Red or refreshing White, choose your destiny! Experience love at first taste! try our EBISU originals! All drinks here are at LEAST Doubles for twice the fun! Add for 2 shot sake! The UME is a popular fruit that has been enjoyed in Japan since ancient times and is deeply rooted in the Japanese lifestyle and psyche. Refreshing, complex and lusciously rich with elegant aroma that will bring pure bliss! Japan's famous preferred choice of drinks! You can't have Japanese cuisine without some premium sake to elevate your meal! Full-boiled & dry in flavour. Elegant, light & extraordinarily clean! Created with superior Kumamoto Yeast. This sake is very smooth, making it one of the ,most easy to drink! Pairs well with sushi and sashimi! Like they say, "Go Big or Go Home!" That couldn't more true than when savouring some invigorating sake! Thousands Years. Made with special brewing rice This produces and ultra premium, high-end sake that is extremely smooth and delicate in taste with a fruity and flowery fragrance. Perfect for Japanese cuisine like fresh sushi & sashimi! Try it and you will definitely not be disappointed! This ultra premium sake has an incredibly smooth & light flavor with a very delicate fragrance. This is truly a top of the line quality sake & is in limited supply! Master Swordsmith. 1.8 Litres! Served Cold or Hot. A well - Structured sake that balances acidity with elegant sweetness. Finishes clean with subtle nutty notes. Highly fragrant and easy drinking, this sake is a great accompaniment to a variety of foods. This versatile and delicious sake can be enjoyed chilled, at room temperature or warmed! Good for your health, and your tastebuds! Deep fried banana sweetened by red been with scoops blissful matcha & tropical mango ice cream drizzled with chocolate. Takes 10-15 minutes to fry to crispy perfection! Delicate Creme Brulee pie, straightforward and unpretentious creation that is so simple, so rich, so praised! It's a tropical party in your mouth everytime you indulge in one! Mango, Strawberry, Banana, Match or Lychee! Two heaping scoops of soft chocolate ice cream served with a shot of espresso poured on top! Servers were all attentive and friendly. Empty oyster plates were cleared at least twice. Service was excellent. Place wasn't really that busy, so you might not get this type of service when it's packed. Very noisy place. Suitable for young adults. Food was average. Service good. I wouldn’t order to takoyaki or miso soup again. Sushi was not bad. It’s a perfect place to host casual party with friends, totally recommend it! Came here couple of times. this round very disappointed with the service. We booked the table for 9:30pm for 2 persons not realizing that they are closing at 10pm instead of 12:00 Not stated anywhere online or at OpenTable website that they have changed their closing time. So was told that last order was 9:30pm. We went ahead since we came all the way. I asked for more wasabi for my sushi, the server said that the kitchen was closed and the last order was already done with ! Huh !? The Udon took some time to arrive, very stressful as we know they were closing. Asked for hot water, the server never delivered. Had to get hold of another server to get them. At the end, we took home the Udon as we felt stressed to stay on. Not a pleasant experience. I had my 22nd birthday party here with 20 friends all ordering food and drinks bringing in $ for the restaurant and an automatic 20% tip. Honestly, the experience was mediocre compared to my previous times at Ebisu I will likely not be coming back for a while. If I was not surrounded by loved ones I would have been disappointed in the night. There was nothing special done for my birthday even though we definitely generated a hefty bill. Not even a free birthday shot, roll, appetizer or dessert, no singing happy birthday or anything for my table. What made it even worse was the manager came out and talked to me asking if it was my birthday and I said yes, he did not say happy birthday but instead asked if we were using a table that we reserved for people that were coming from work. He made us feel uncomfortable and unwelcomed as guests which would have never happened at Earls, Cactus Club or Boathouse. We also seemed to get ignored and received poor service the entire night. I booked over a week in advance, this lack of hospitality should not be acceptable. Caution they called me in a very sketchy manner asking for a deposit that I have never heard of for $100. They threatened to cancel my booking if I did not put the deposit down and I had to give them my credit card over the phone, this screamed scam to me as I already booked on OpenTable but I had to as there was no hope for me to get another booking for 20 people with 1 day in advance. I can't get my time or money back; however, I would advise you to stay away from this place until they learn how to treat customers with some basic respect and hospitality. Service was quite fast. Food fresh. Great for office lunch. Good service and nice atmosphere. Food is a little overpriced but not bad. Very loud. It was crowded as our table next to us was literally sitting at our table. Also, it was EXTREMELY loud and was unable to carry any conversation. Also, the service was pretty bad. Our sushi was about 45 minutes late as the people who were seated well after us had their food and was done prior to us receiving the sushi. Wouldn't go back with my guests. I had a birthday reservation for 17, for some reason they split up my group even though I booked 1 month advance. Food was decent but based on the service I wouldn’t come back. Could have been rated 5 stars, but we arrived on time for our reservation of 2 and waited 20 minutes for them to clear a table for us that they obviously did not have prepared. The ambience was fun and a bit noisy, which made it a bit hard to be intimate, but we still had a good time. Expansive drink menu was the highlight of the experience, but the language barrier made it slightly more difficult to ask questions about anything on the menu. The spicy lobster roll was very good and searing it right at the table was the perfect start to the meal! It's a great menu and the fish is always fresh! In addition to the usual sushi and sashimi, they have many other items as well to tempt you. Service is always friendly. Exceptional food, great service and lovely environment. Great place to take an out of town guest to experience Vancouvers sushi. Food is good. But poor customer service. Our experience with the dine out at Ebisu was dissappointing. We could hear the peopke in next table talking very loudly. The food was cold and the sable fish was stale (probably frozen for days) . Overall, we did not enjoy the food and will not return to the restaurant. I recently went for Dine Out. I went with the Wagyu Carpaccio, Alaskan Sablefish and Chocolate Mousse and all 3 were terrific. Others in my party had the other options and found them delicious as well. My only complaint would be their timing of the meals being served was not the best. I finished my main course before the others received theirs. This is our go-to family sushi place after a skate at Robson Square or a busy day. It can get noisy on a Saturday night but the food makes up for it ! We made a reservation, and arrived to wait at the door for another 15 minutes while others that arrived after us WITHOUT reservations get seated. We ordered promptly after sitting down since we had the time at the door to read the menu, recieved our wine 5 minutes later, then another 20 minutes before our appetizers arrived. Finished it and had our plates cleared, where we then waited another 20 minutes for our main course. While eating my main, I decided to order something else extra on the side that I knew I liked (hamachi inferno). Then our plates were cleared again, our server was switched with someone else as she needed to go on her break. The table beside ours was an older couple and they had also ordered their food half an hour ago and all they had was a pitcher of beer which was nearly depleted by now. They had asked for the new server for a follow up and she came back to reassure them that it would arrive in 2 minutes. The couple had tried to explain how they weren’t happy about how long they had to wait but the waitress continuously interrupted them through their plight. It was terribly unprofessional to interrupt someone’s speech to begin with and to be paired with her attitude towards the situation was aggravating. After they received their food, I was brought my dessert when I clearly wasn’t done the rest of my meal. So I raised my hand to ask about my order since I had finished my main about 25 minutes already, and I had no other food in sight to eat. The new server never came back to reassure me, and my original server came back from her break and that is when I received my hamachi inferno. When I mentioned about how I’ve had to wait a total of an hour and half just to eat more food, the server couldn’t answer me so she brought the other waitress back to give me the same attitude and interrupted me while I spoke. The service that we had received was unacceptable, although your food may be good, my experience here at Ebisu on Robson was terrible. The food was definitely A+ (so we ordered more food on top of the DOV menu) but the service was a little slow for our liking. Planning to go back again soon. The sashimi bento box was amazing. I may have to visit Vancouver again soon just for that dish. Food and service were great. Staff were very friendly. It’s a great restaurant for big parties. Excellent dine-out offerings-- superb food and good service. Had the Dineout Menu: Roast lamb was delicious but was only 2 ribs, plus a piece of foie gras with a few strips of potatoes & veggies. Wagyu carpaccio was very thin and covered with Parmesan. They were out of matcha tiramisu, had chocolate mousse. Meal was not substantial, especially for my 2 teenage boys. Also ordered Aburi lobster sushi, Aburi Saba sushi & chicken karaage. Lobster sushi was great but the Aburi saba sushi was a let down, had no sauce or enhancements unlike the Aburi lobster sushi. Dessert was mediocre. We spent $170 included tips for 3 with no drinks, just water. Overall, expensive for 1 adult, 2 boys (and not very full). Japanese restaurant should not make western food for Dine Out Festival. I had their Japanese food, it was not bad. I like the food over there. The servers are nice and friendly. I will go there again. It was amazing! Food was all wonderful and i especially loved the tuna tacos. It was good overall and our main server was nice. However other servers would be in a hurry to take our almost finished plates. Yes they would ask but one server did not wait for our reply. And our motoyaki was not done yet. Maybe next time make sure to hear the reply first, before removing plates with food, food that we will be paying for. Happy New Year! New Years dinner. It was a festive environment with attentive service but the sushi was mediocre. They were very busy. Perhaps a bit understaffed for New Year’s Eve but food was great as always. Its a drinking restaurant for young people, i would recommend go there before a night out. I was very upset. I had a reservation for 9:30pm with 20 people, we weren't seated until 10:15pm. A lot of us were stuck waiting in the front for another party to leave. We were offered a free round of shots but the shots were watered down. The birthday celebrant and a lot of our friends were very disappointed, as was I because this was the first time I've ever had a problem like this here. I really hope this doesn't happen again. Overall experience was ok but the service was really slow and the food quality was not up to par. Was looking forward to eating there but I left a little disappointed.